Water quality monitors receive training to become certified and follow strict protocols, ensuring the quality and high value of the data they collect. 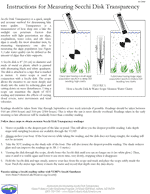 Below are instructions and data forms used by water quality monitors. Each spring as a volunteer you receive a packet with new Secchi data forms, mailing instructions and personalized information, including your Secchi Simulator login. Please Note: If your Secchi reading is less than 2.5m we would like to know. Call it in to Lake Stewards of Maine (LSM) at 207-783-7733 or stewards@lakestewardsme.org. Please include your name, lake and date of the reading. The Sawyer Lab in Orono is no longer doing phosphorus testing in conjunction with the LSM. 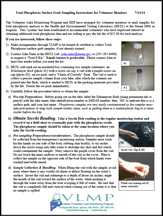 The HETL lab in Augusta is doing phosphorus testing for volunteers; please see PDF for contact information and TP Sampling Protocols. Instructions for taking a Total Phosphorus Surface Grab. Notice: Do Not Print Field Sheets on Inkjet Printers. Field sheets must be completed in the boat at the time of your readings. There is a good chance your forms will get wet and inkjet printing runs when wet. Please use a laser printer or contact the LSM office and we will gladly mail you extra data forms. And please make a copy of your field sheet for your records prior to mailing. We want to be sure your hard work does not get lost in the mail. Annual re-certification is now required on the Secchi Simulator. Your login should be included in your spring packet or contact the LSM office at 207-783-7733. Presentation Slides from the New Monitor training workshop. File is large and may take a moment to load. Please help us estimate the value of the contribution made by LSM Water Quality Monitors and Invasive Plant Patrollers to the monitoring and protection of Maine waters. Use this sheet (front and back) to track any time and expenses related to your monitoring and lake stewardship activity for this year. Quality Assurance Project Plan (pdf 150k). The QAPP (“Quality Assurance Project Plan”) is a guide for proper procedures for lake water quality monitoring by volunteers in the LSM. This plan has been reviewed and approved by the U.S. EPA, and describes the LSM structure and how we assure that quality data are gathered. It can serve as an example of how a formal Quality Assurance Plan should be constructed. Stay current with Publications including The Water Column and the Maine Lakes Report online.